XV century clothing in Italy. Home » XV century clothing in Italy. XV century clothing in Italy. Early renaissance fashion. Upper left half of the image: Fashion 1450. Pharmacist clothing in 1430. Right: Italian Podestà, church warden and soldier. Lower half of the image on the left: Lady in the fashion of 1450. Elegant lady and gentleman in the fashion of 1480. Right: Lord of Rimini and archer in demonstration position 1488. Beatrice d’Este, patron of Leonardo da Vinci in the fashion of the year 1490. 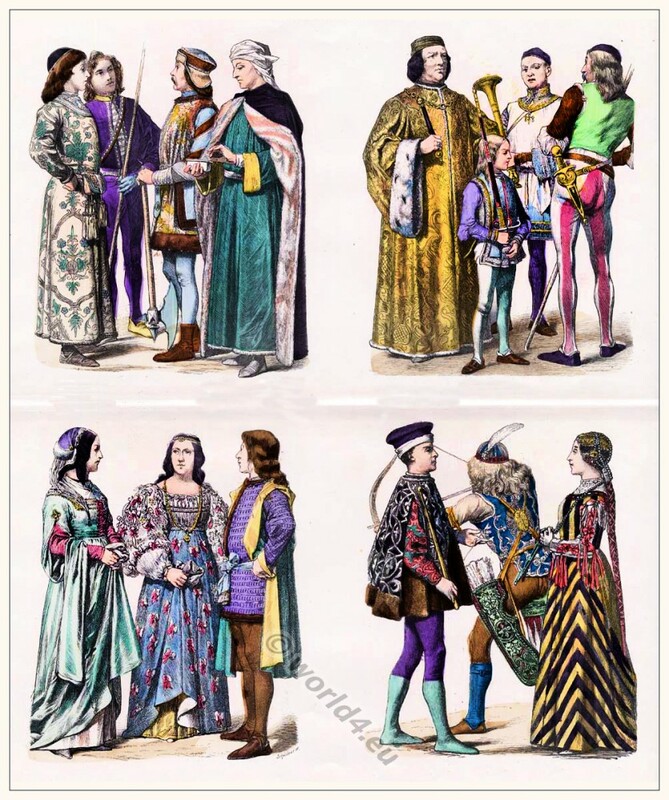 “On the history of costumes”. Münchener Bilderbogen (Munich pictures sheets). Published by Braun & Schneider, Munich c.1858 -1898s. This entry was posted in 1450, 1480, 15th Century, Italy, Renaissance and tagged Medieval costume, Münchener Bilderbogen, Renaissance fashion era on 11/3/13 by world4.